When people think of Spain they picture sun, sea and the costas. In some it evokes thoughts of drinking cheap sangria before hitting dodgy resort nightclubs in complete inebriation. For many, the Iberian Peninsula calls to mind paella and flamenco. In other words, Spain has been typecast into an Andalucian caricature, but if you travel inland to the cities of Castille you’ll find an altogether different flavour. 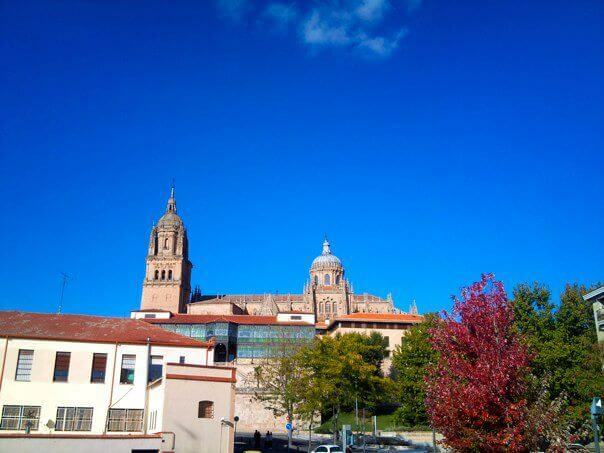 The small town* of Salamanca is situated in the province of Casilla y Leon. It only takes two and a half hours to travel by train from Madrid, making it a fun, easy and interesting destination if you’re looking to spend a night away from the manic chaos of the Spanish capital. 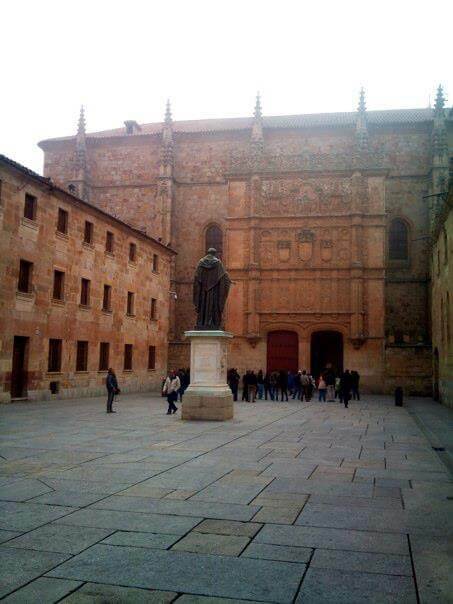 Salamanca is home to Spain’s oldest university, making it the Iberian equivalent of Oxford or Cambridge. The student presence in the town adds a youthful edge, since there are plenty of bars around the city that are bursting with life. 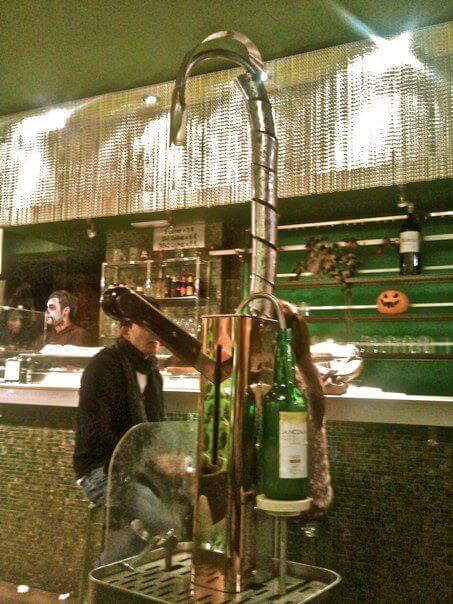 Whether you’re looking for the standard “cañas y pinchos,” a small beer with a light snack, or a bottle of Asturian cider attached to a guillotine-like machine that pumps cider from the bottle with precision into your glass from a great height: Salamanca has it all. excruciatingly hard: Quantum Field Theory and High Energy Physics at postgraduate level are bad enough without having to deal with lectures in a language you’ve only been “speaking” for six months. 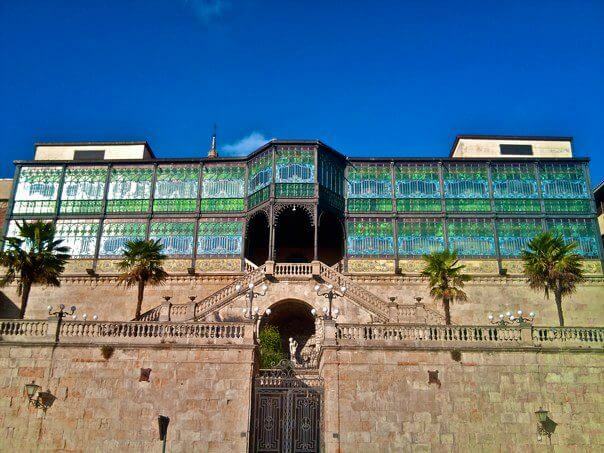 One place worth a visit is Casa Lis, it’s a beautiful fin de siècle building with amazing stained-glass work. Casa Lis houses the Museum of Art Nouveau and Deco (and the creepiest selection of porcelain dolls ever) and I really wanted to revisit it. On my second visit back, I discovered they have opened a café in one of the front wings. 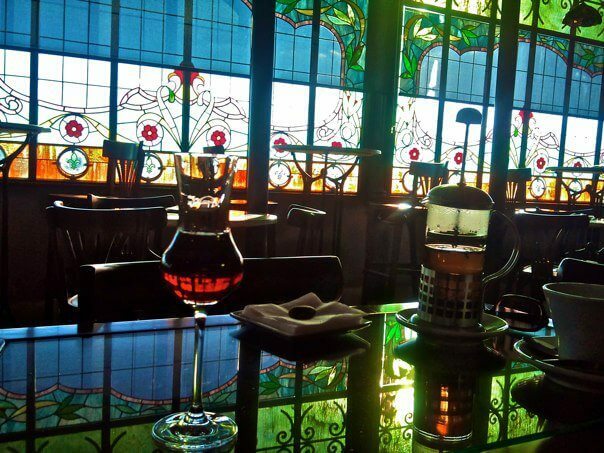 The café is situated in a room with stunning stained-glass windows and decked out with vintage style furniture, which has kept the café in style with the house. Sipping port (one of my weaknesses) paired roquefort (another weakness) for a good part of an hour was an absolute pleasure, and a visit to Casa Lis should not be missed by anyone paying a visit to the city. The museum is excellent for anyone who loves art nouveau and deco objects, and even if you’re not a huge fan, the building itself merits a visit. 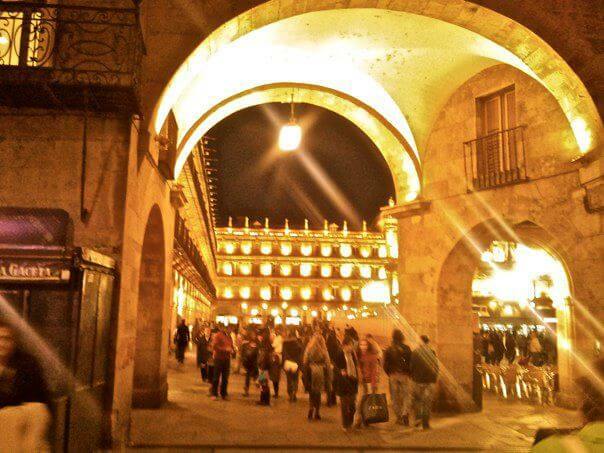 An evening stroll took us past Salamanca’s monuments, from the two Cathedrals and the Casa de Conchas, the house of shells, and we finally entered the iconic Plaza Mayor, one of the most beautiful squares in Spain. You can find many bars and eateries surrounding the city’s main square, with plenty of student haunts found in nearby side streets. Eating out in Salamanca is inexpensive and the food quality is high, most notably the meat dishes. This is one city where you’ll keep your gastronomic juices flowing while your wallet breathes a sigh of relief. If you’re a wine lover, then consider yourself lucky. Unlike the rest of Spain, comparatively speaking that is, high quality wine is inexpensive in Salamanca. A thick fog shrouded the town in the morning and you could barely glimpse the Cathedral behind the Art Nouveau Museum as before. It was cold, but atmospheric. Salamanca lived up to its reputation for being one of the coldest cities in Spain. This is a far cry from the costas and if you travel inland a little further and you’ll end up in Portugal. It’s is a city seldom visited by tourists, so the streets are quiet and eerie. 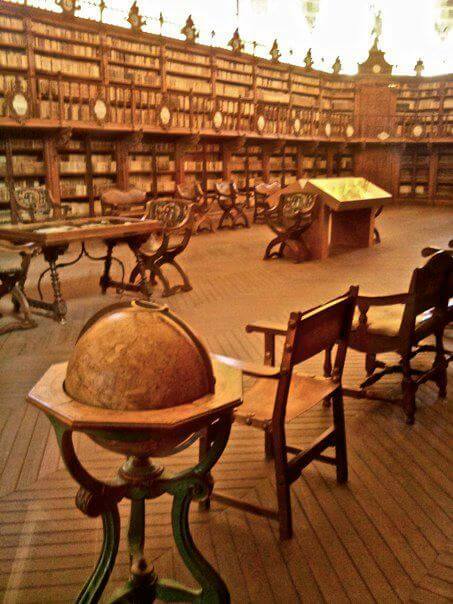 A visit to Salamanca isn’t complete without a trip to the old university. You must take a look at the façade and look for the famous frog — it’s supposedly good luck if you see it. 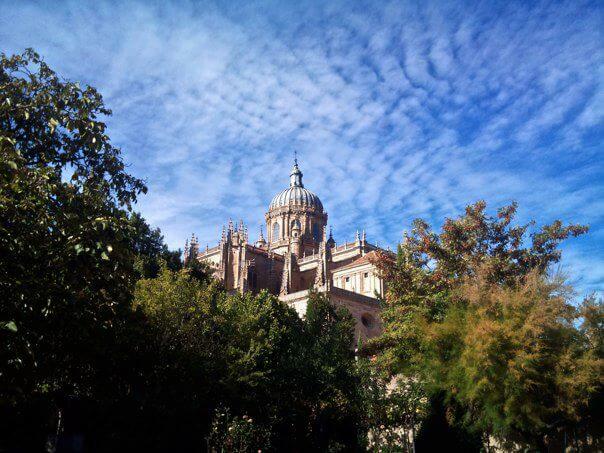 The University museum is interesting for the historic library alone, but you should visit the “Salamanca Heavens” fresco, a stunning Renaissance ceiling depicting the zodiac. Take a turn into the cloisers and you’ll find a small door leading to the “Salamanca Heavens”. Entrance is free. 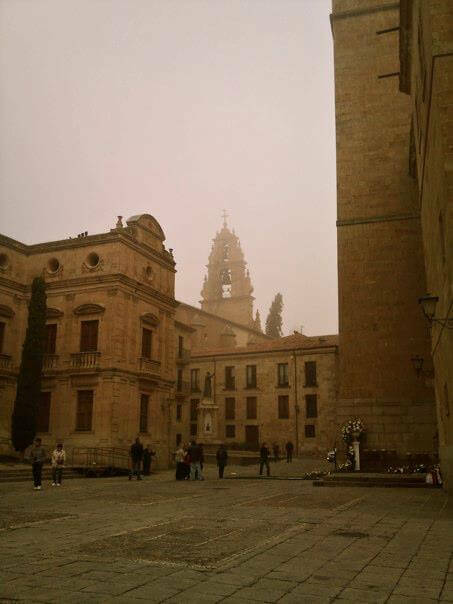 Salamanca can be easily visited in a day. All the sites are within walking distance, but it’s worth staying the night to sample its student night life. It is a small town, but it oozes atmosphere, and has a certain je ne sais quoi that other places just don’t have. Whether in the sun or fog (or rain, as I recall from my first trip), it’s a city that will always remain beautiful. Have you visited any of the smaller towns in Spain? Does Spain conjure up images of the beach and parties, or do you think of Cervantes and El Cid? I’d love to hear about your experiences and take on the country. 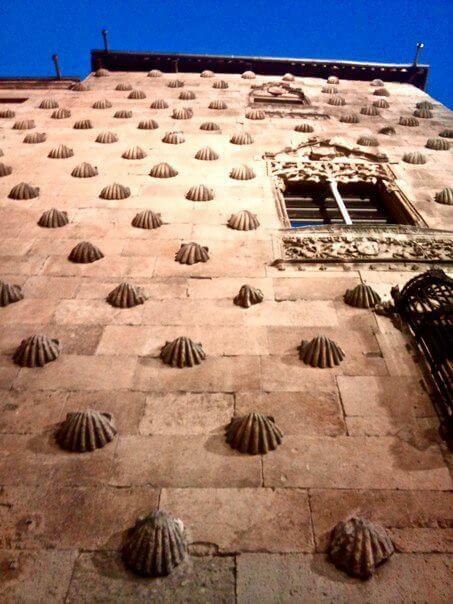 *Well, Salamanca itself isn’t exactly small, but visiting the historic centre it leaves you with that small town feeling.